“Agonized Corpse” kicks the album off with a fast melodic pace, matching the intense growl and mix of vocals from the two band members, each bringing their own style to the sound. Both also show their skills on the instruments. It’s a fast Death Metal pace that also has a modern intro that builds up the tempo. This is Modern Death Metal. The guitar pace is something you’d expect to hear BEHEMOTH belt out in style. The raw vocals build up without overshadowing the melody and overall sound of the track, this is a great start. “Hellspeed” is not slowing down from where “Agonized Corpse” left us wanting more. The intense beat is thick and works very well to gel every aspect together. The dark ambience builds up with the distorted vocals shouting out. It’s not a long song but it ticks the boxes of what you want to hear. The tempo is balanced well in the opening tracks without pushing too far to try something new. 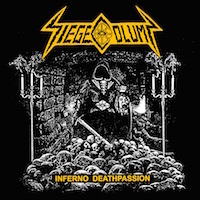 “Siege Column” is frantic once more with a short outburst as an intro, the vocals are more upbeat here and it works well with the tempo all round. This is a mash up of all the great aspects we have heard so far, and it’s a great cocktail. The guys show their skills once, they run off each other with the skill set and experience of veterans. A Black Metal-esq eerie piano intro is how “Sathanas Is Near” greets us. The song contains explosive solos that are heavily fluent in thrash crossover. The vocals are more growl, which allows the concentration to go onto the instruments. The whole song feels dark, like a storm with flickers of lightening in the guitars, it’s beautiful. The drums meeting the guitar is pulsating throughout and works perfectly.